Shoulder pain is common – this page outlines some of the things that can cause it. Your shoulders are the most mobile joints in your body. They are ball and socket joints, but the sockets are not deep enough to hold the balls securely – they need the surrounding muscles and tendons to keep them stable. The muscles and tendons that hold your shoulder in place are called the rotator cuff. Each rotator cuff is made up of four muscles and their tendons, which you can see in the illustration on the right. As well, a tendon of your biceps muscle attaches nearby, and there is a bursa (a fluid-filled bag) that helps your rotator cuff glide over the nearby bones. Problems with your rotator cuff and bursa cause most shoulder pain. But joint and neck issues can also be the cause. If you have a painful shoulder, try some of the exercises below. If your pain isn't getting better after two to three weeks, see your GP or physiotherapist. If pain develops suddenly and is worse at night, see your GP. Your rotator cuff tendons and bursa are in a space between your acromion bone and the top of your upper arm bone (the humerus). They can become painful for several reasons, making your shoulder weak and difficult to move. Poor posture, using your arm too much, or working with your arms above your shoulders can make it worse. Avoiding activities that aggravate your pain may help, as can exercises that lift up your breastbone and correct your posture. You can do the pec minor stretch and shoulder blade squeeze exercises at home. Many people get calcium deposits in their rotator cuff tendons. They are most common between the ages of 30 and 60, and affect women more than men. They usually don't cause any symptoms, but in some people they can cause pain, which can be severe. The pain often starts when you're resting, or moving your arm away from the side of your body. Your shoulder may be hot and red, and the pain might be worse at night. If you feel unwell, have a temperature, or have severe pain see your doctor to check for other causes and to get pain relief. For the first few days you can use an arm sling to keep your shoulder still. The pain may settle down in one to two weeks, as your rotator cuff heals. You may need a steroid injection to ease the pain and help to dissolve the calcium. Once the pain settles, it's important to get back to normal activity. Do as much as you can without causing further pain. You can also try to do the shoulder adduction and abduction, and flexion and extension exercises. It can help to see a physiotherapist for other exercises that will help your healing. You may have to pay for this – talk to your GP if that is a problem for you. Over time your rotator cuff tendons can wear down, which can become painful. This is called rotator cuff tendinopathy (it used to be called rotator cuff tendinitis). If the pain is bad, ask your GP for suitable pain relief. You should avoid any heavy lifting, but don't rest totally, as your tendons may become more painful if you are totally inactive. The best treatment for rotator cuff tendinopathy is to do exercises that will help to strengthen your tendons and the muscles around your shoulder. These include the shoulder blade squeeze, and resisting rotation inwards and outwards (as long as it doesn't make your pain worse). The sooner you start doing these exercises the better, as they can stop your muscles from becoming weak. The way you stand and sit (your posture) affects your shoulder tendons, as does physical activity, leg strength, and what you eat. See a physiotherapist to learn about how you can manage your pain and better use your arm. Exercises to improve your posture and strengthen your shoulder may help. You may have to pay for this – talk to your GP if that is a problem for you. 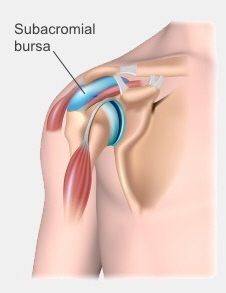 This condition, which is also called subacromial bursitis, happens when the bursa in your shoulder becomes inflamed and swollen. Impingement is the medical term for when something becomes trapped, compressed, and inflamed. Subacromial impingement syndrome is very common, and can happen with or without an injury to your rotator cuff. If you have subacromial impingement syndrome you are likely to feel pain when you lift your arm out to the side or behind your back. Often there will be less pain when you lift it higher. It's best to avoid overhead activities like pruning hedges, hanging washing on a high line, swimming, and tennis. As it gets worse, you feel the pain more often. You may be bothered by pain at night. The first step in treatment is to get your pain under control. See your GP to get pain relief. A steroid injection may help if it is very bad. Once your pain is under control the next step is to see a physiotherapist to find out what is causing the inflammation. They can help you to change the way you do things to decrease the pain, and show you what exercises may help you get better. Exercises you can do at home include the pec minor stretch and shoulder blade squeeze, towel squeeze, and resisting rotation inwards and outwards. Your acromioclavicular (ak-ro-me-o-cla-vik-u-lar) joint (usually called your AC joint) is at the top of your shoulder, between your collarbone and your acromion. This joint links your arm to the rest of your body, and helps you transfer the load to your body when you are doing things like pushing, pulling, or lifting something. Arthritis in your AC joint can make these movements very painful, limiting your shoulder movement and strength. Overhead activity and any movement that takes your arm across your body can make it worse. The first step in treatment is to get your pain under control. A steroid injection can provide some pain relief. Your physiotherapist can give you advice on how to change the way you do some things, and what you should avoid doing. They can also show you exercises to help keep your shoulder blade and shoulder joint moving. Exercises you can do at home include the shoulder blade squeeze and shoulder shrugs. You will find more information in the arthritis section. An injury in your neck (also called your cervical spine) can also cause pain in your shoulder, shoulder blade, and arm. This is called referred pain, which means the cause is in one part of your body, but you feel it somewhere else. Pushing or lifting heavy objects can cause a neck injury. The joints in your neck become inflamed and the muscles can also become tight and painful. If your shoulder joint can move in all directions but you have limited movement (and pain) in one side of your neck, it is likely a neck problem is causing your pain. The muscles in your arm and hand might also be weak. If your arm or hand is numb, weak, or tingling – especially if it's getting worse – you should see your GP. If you think a neck problem might be causing your shoulder pain, see your GP or physiotherapist. Depending on what they find they can give you techniques to relieve the pain. Your physiotherapist can also give you exercises to relieve the pain and prevent further problems. Frozen shoulder and rotator cuff tears can also be painful. You can read more about frozen shoulders and rotator cuff tears.